A crowd favorite, especially with older kids and adults. Two racers go head-to-head to see who can make it the farthest down the lane before being pulled back by the bungee harnesses! (Includes all accessories for two users; Bungee Harnesses, Carabineer Clips, Bungee Cords, and liability waivers.) 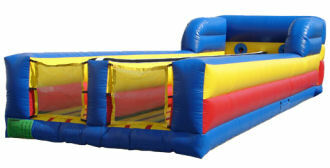 Each participant will be required to sign a liability waiver.